Following a similar race in 2010, the heated race between Rep. Tim Bishop (D-Southampton) and his opponent Republican Randy Altschuler ends today. Polls opened at 6 a.m. Tuesday across Long Island, and in addition to a tight Presidential race, there are several contentious local races wrapping up today. However, due to Hurricane Sandy, final polling conducted by Siena College before the elections was cancelled due to concerns that maintaining an adequate polling sample would not be possible. Long Islanders will be heading to the polls today without a final indication of how their fellow voters are deciding in several key elections for the state, including New York’s first congressional district. Rep. Tim Bishop (D-Southampton) has been engaged in a heated campaign against challenger Republican Randy Altschuler, following a similarly intense campaign in 2010. The latest polls, conducted in mid-September, gave Bishop a 13 point lead. In 2010, the race was initially called in favor of Altschuler, before a recount showed that Bishop had won the legislative seat by 593 votes. Altschuler’s campaign manager, Diana Weir, dismissed Siena’s last poll, saying, “One looks at how badly they botched their 2010 polls, and it’s impossible for any reasonable person to take the Siena poll seriously.” Prior to that campaign, Siena polls showed a double-digit percentage lead in favor of Bishop, and Altschuler’s campaign complained that it ultimately biased the election in favor of the Democrats since the final margin was so close. Since early October, both candidates have been locked in an ongoing debate regarding Altschuler’s company, OfficeTiger, that Rep. Bishop has labeled as an outsourcing agent. Altschuler has defended his company, saying that it has only created jobs overseas, and not moved them. Long Island currently has an unemployment rate of 7.3 percent, and in September 11,100 were added in Nassau and Suffolk County. Yesterday, Gov. 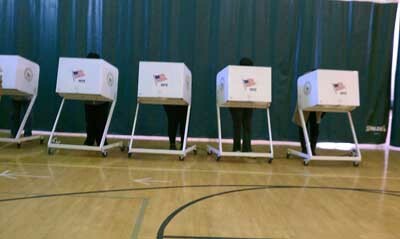 Cuomo announced that by Executive Order, New Yorkers affected by Hurricane Sandy would be able to cast their ballots at any polling site. The downside, as the governor called it, is that voters who go to polling sites outside of their election districts will not be able to vote in local races. Subject: LongIsland.com - Your Name sent you Article details of "Election Day Ends Heated First Congressional District Campaign"